A decent, sturdy workhorse that delivers good performance. Its biggest asset though remains its massive ink cartridges and promises of cheaper print and maintenance costs. Epson decided to focus on the basics for its new business printer range with a new, improved piezo-electric head technology called PrecisionCore and a surprisingly simple ink container in the form of a plastic pouch. I spent some time with the Epson WorkForce Pro WF-R5690 which is a multifunction inkjet printer that will be available towards the end of the year. I've been told it will only be available for purchase via select print service providers as part of a managed print service offering, which is a real shame. 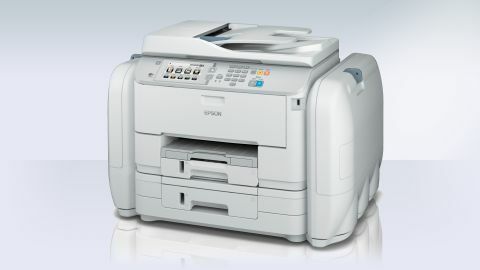 The MFP adopts a fairly standard form factor with a white and gray colour scheme. It comes with two trays by default which is a compulsory design feature as it allows the printer to be high enough to accommodate for a new feature called RIPS which we covered previously. RIPS is essentially Epson's own version of the popular but controversial continuous ink systems (CIS) but done the right way. Epson provides the inks in 1L (for the three primary colours) and 1.5L (for back) pouches that resemble big Caprisonne bags. That technology has been paired with Epson's new PrecisionCore head which inherits DNA from its range of high-end industrial printers. The company claims to have invested around 125 million euros in production facilities in Japan. The latter contains enough ink for up to 75,000 prints which is far more than any commercial, high capacity laser toner cartridges on the market. Although Epson declined to tell us how much the consumables would cost, each cartridge is likely to cost more than £1,000 (around $1,663/AU$1800). The business laser printer market is where Epson is aiming to cause the most havoc and unlike other competitors, doesn't seem to have any qualm seeing inkjet taking away market share from laser. RIPS essentially negates the need for swapping cartridges each time which has been one of the most irritating aspects of IT administration. The pouches feed into the printer via proprietary connectors and are located in two big storage areas on each side of the printer, secured with padlocks. The front of the printer has a colour control panel, multiple buttons, a USB connector, a door that gives you access to the (permanent) print head, one sheet tray and two paper loading cassettes. Rear connectors on the WorkForce Pro WF-R5690 MFP include an Ethernet port, a RJ11 and a USB one; it also does Wi-Fi (including Wi-Fi Direct) and has a card slot. Unlike competitors, it doesn't allow Wi-Fi or NFC although oddly enough, if offers QR-code authentication. Epson claims that it will consume up to 80% lower energy compared to competitive colour lasers. I was not allowed me to fire up my own test files but instead used a standard ISO document. As far as print quality is concerned, print outs were on par with what I've seen on other business inkjet printers. The MFP will be available later this year via selected partners and an A3 version will also be available. As mentioned earlier, you won't be able to buy RIPS-capable printer and its consumables through usual retailers. A spokesperson for Epson also hinted that RIPS technology might trickle down to more models in due time, with entry level ones likely to benefit from it.